“These are cavas and wines produced with fruits grown organically and bio-dynamically and that transmit to me a myriad of feelings which I’d like to share with you. Every day that goes by I am more aware of how pleasant my role here is. And I realise that I am part of this land, which has no beginning or end,” Eudald Massana Noya. Our tour was brief, but winemaker and founder, Eudald didn’t skimp on expressing his heartfelt passionate to peruse organic winemaking practices, nor did he forget to impress us with is 100% monovarietal Xarel.lo wine called, Avi Ton. However, 4 years ago, Xarel.lo was still very new to the Spanish table wine scene, and organic winemaking was merely a consideration for the winery. The 2007 Avi Ton showed rich lychee and cream on the nose under a thin veil of citrus and mineral aromas. Classy, structured, elegant and unbelievably memorable, it opened my eyes as to the potential of not only white wines in Spain, but also wines made from Xarel.lo. I envision Xarel.lo as a cross between the coquettish and cute Drew Barrymore and the spicy sultry side of Charlize Theron. She’s the grape that gives Cava its gorgeous structure and acidity, when paired with Parellada and Macabeo, while offering just enough citrus and stone fruit flavors to entice you in for a second sip. She’s extraordinarily vivacious, capable of producing grapes at a rapid pace, but gets hurt rather quickly when frost bites upon her thin-skinned exterior. What can I say, she’s the studious girl next store with a sweet smile, serious features and soft heart; and beyond a doubt, she’s one of my favorites. Last week, while visiting one of our favorite Barcelona wine shops, Vila Vinateca, we decided to indulge in our Xarel.lo addiction by purchasing the 2009 Can Dez Mas L’Equilibrista and the 2007 Pardas. Since 1548, the 26 hectares of Can N’Estruc has been situated alongside the steep, jagged mountainside of Montserrat in the town of Esparreguera. Cultivated, managed and owned by Francisco Martí, the vines are located at 165 meters above sea level, sheltered by the frigid northerly winds that rip down the searing mountain edges. To their great relief, these pampered grapes enjoy gentle, cool summers and warm, relaxing winters. Not a bad life! The 2009 Mas L’Equilibrista shows a unique side to Xarel.lo, expressing more herbal characteristics, though still highlighting her citrus side. In the mouth, the wine is subtle, creamy and inviting, giving just enough citrus and tropical flavors to tantalize the palate, but not enough to provide a harsh and searing flavor. 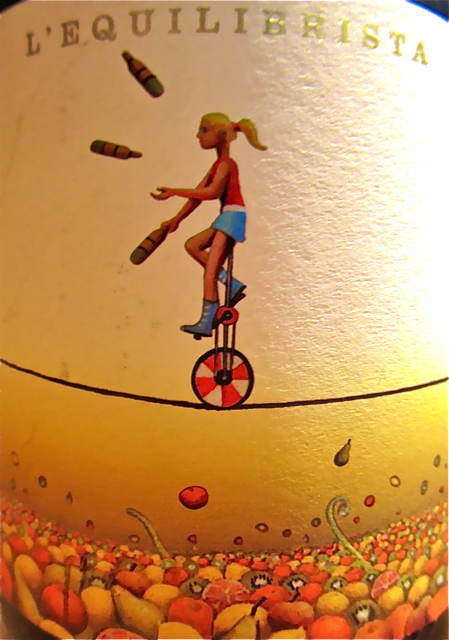 Where the L’Equilibrista shows brightness, the 2007 Pardas screams lush. The Pardas project was born of oenologist, Ramon Parera, and agronomist, Jordi Arnan, in 1996, when they decided to turn their combined 30 hectares of forest and 30 hectares of grainland and pastures into vineyards. Having restored the medieval country house, propped in the center of their estate, into a thriving winery and expanded the estate to include vacant cemetery land (the best kind) and an adjacent vineyard, their project was launched around 2005. With a passion for sustainable winegrowing, their vineyards are never irrigated, are minimally worked and never plowed, and are protected from harsh chemical treatments. In short, sustainable appears to be the mission statement of this winery; and potentially, one of the many reasons why their 2007 Pardas Xarel.lo is drop-dead gorgeous. This is a wine I’d pair with a grilled swordfish over a bed of couscous and a side of fresh garden vegetables with a touch of basil. And while you’re add it, open up a second bottle and pair it with a lemon sorbet with freshly baked Spanish Almendrados. Like many Spanish white grapes, Xarel.lo can age. It can sleep sweetly in your cellar for years to come before showing a more mature, lush and broad side of itself. Though Xarel.lo does have a vivacious and festive side to herself if enjoyed today, her acidity and structure can offer a very serious and elegant wine in the future. What Xarel.lo monovarietals or blends are your personal favorites?